In July 2011, Historic New England carpenters opened the floor in the hall of Boardman House, a remarkably intact seventeenth-century property in Saugus, Massachusetts. Intending to begin repairs, they discovered white oak “sleepers,” a floor system that sits directly on the ground, laid in the dirt below. 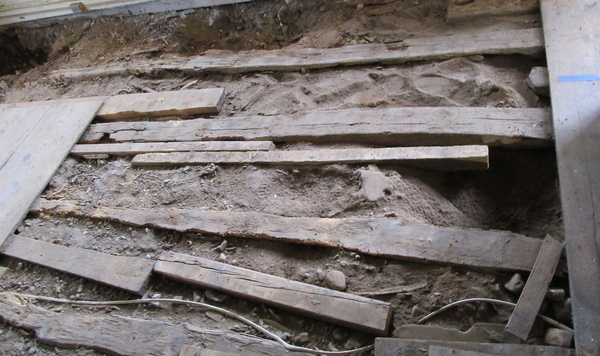 These sleepers had been repaired and replaced at some point during the lifetime of the 1692 house. Historic New England makes every effort to preserve as much historic material as possible. In this case, however, we re.alized we needed to replace two of the sleepers in their entirety. White oak timbers, sourced from a sawyer in western Massachusetts, were lain in a combination of crushed stone and dirt. In June 2017, the original subfloor and much of the historic finish floor were reinstalled. 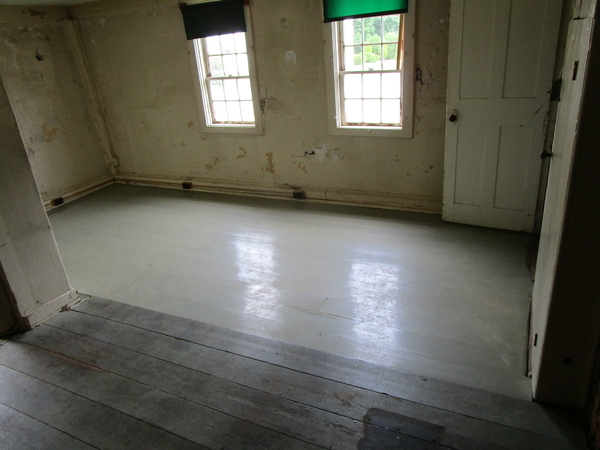 Unfortunately, though our team took great care while removing the original subfloor during the 2011 investigation, not all of the historic finish floor survived. We sourced new southern yellow pine boards and matched the paint color of the historic floor to finish the job. Visit Boardman House to see the restored floor and the house’s rare surviving architectural features. The house is next open for tours on Saturday, October 7, from 11:00 a.m. to 3:00 p.m.